Unit under test at workbench. And i could no longer adjust it with the negative bias Voltage. The - Voltage went to zero and the SPF input port became low Z. 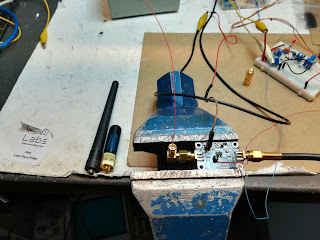 This SPF5189z was broken no oscillations, no input overload just it broke while i was receiving the PI2NOS 430.125 using a small antenna at the workbench. The specs of SPF5189z say it has an internal circuit regulating the bias current. Replaced . again with an other of the 5 spare SPF i have. The current raises to 150mA when removing the negative gate voltage. Where is that internal bias circuit ? I suspect eBay SPF5189z devices like al other eBay semiconductors..
result: 0.73dB nf @ 23cm 0.45dB nf @70cm out of the box! Reduced to 3V with 3x Si diodes and a 1 OHm serial resistor. current still about 100mA . This way it was running months with good result. Added SWR bridge to monitor the TX down in the shack. Still unsolved Solar Edge noise and digi 200kHz apart carriers. Repeating every 200kHz in the whole 1MHz to 150MHz band SolarEdge works as a broadband QRM transmitter ! Digi thrash cariers with maximum of 9+20 at 14.198 MHz on a dipole repeated every 200kHz. up to VHF ! Frustrating that QRM like this is legal and malfunctioning Solar devices can operate like this. A ham would think just build TX and skip the LP-filters..
My own Solar Frontier SAF3600 system is absolute RF quiet. No signs of self oscillating. Matching to the 23cm slot dipole SWR 1:1. The antenna relay okay, so what else could it be then the pre-amp became bad? Still receive Beacons much weaker then usual. The Device specification says 5V 90mA . The output Z went up from zero to a high value ! As if this SPF5189z would need a negative input bias Voltage. 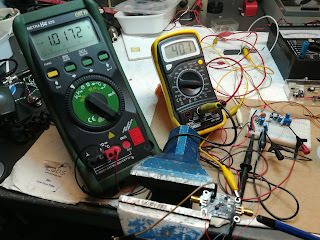 So i made a smal negative voltage source adjustable and through a small choke coil applied it to the input gate of the SPF5189z and voila smoothly the Supply current is adjusted to the wanted value. The RF detector at the output goes high. A negative Voltage supply with the NE555 or 2 transistors 1kHz AC oscillator both work okay. But the whole thing became a bit more complicated. The collector output is connected to the negative rectifier circuit below. <3v ...="" p="">So my SPF5189z need negative bias and i am the only Ham experiencing this? I confirm that SPF5189Z from two EBAY stores works on 2.6V at 100mA. Recommend power supply by Mini Buck Converter that does have smd chip marked AGCG. It will step down from any 5V or higher source. 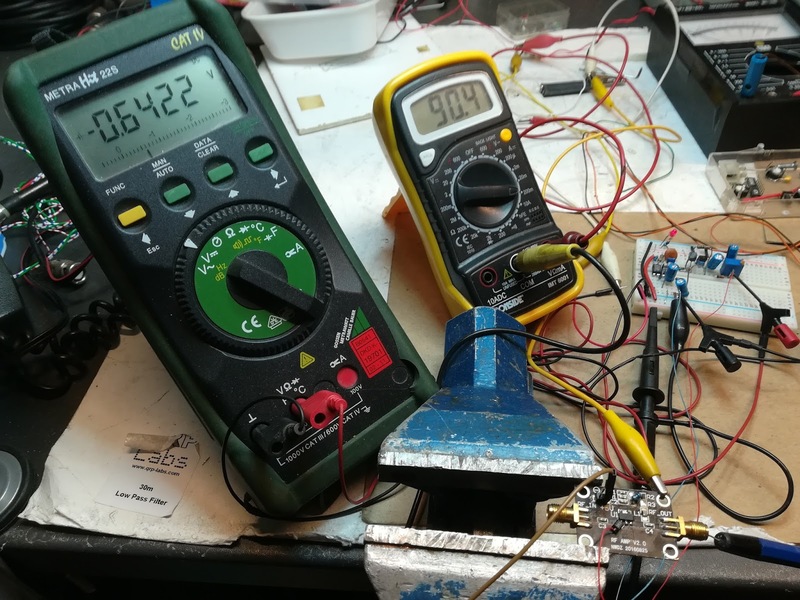 Yes, it is not possible to connect such SPF5189Z directly to 5V, because it will become very soon overcooked, and burn dead by currents in excess of 150mA eventually. Let me suggest another method to force the amplifier to behave properly. Cut the ground plane of Minus connector, or provide separate board for supply connecting. Insert in Minus line toward ground a parallel of: 10R 10R 100n. 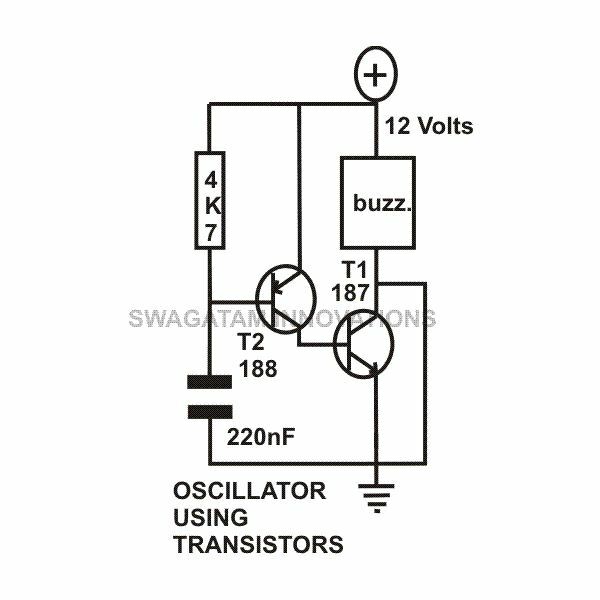 Voltage drop on (smd) resistors will be -0.5V, power neglectable. Connect the input pin of amplifier as you did, through small inductor to -0.5V. 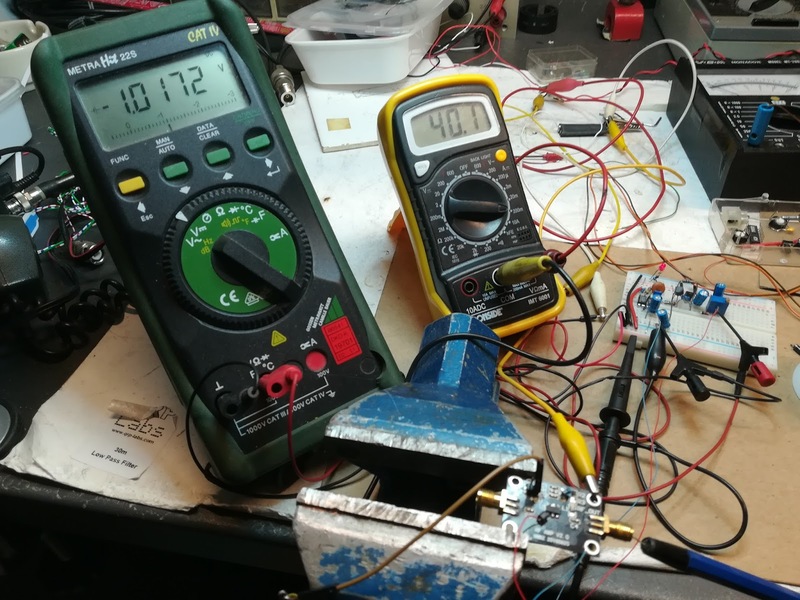 Mind the 100pF immediately after the inductor to ground. Having relative poor signals on the local 70cm / 2m channels using this Diamond collinear 70/2 combi antenna at a height of 25m. I needed to investigate what could be wrong. 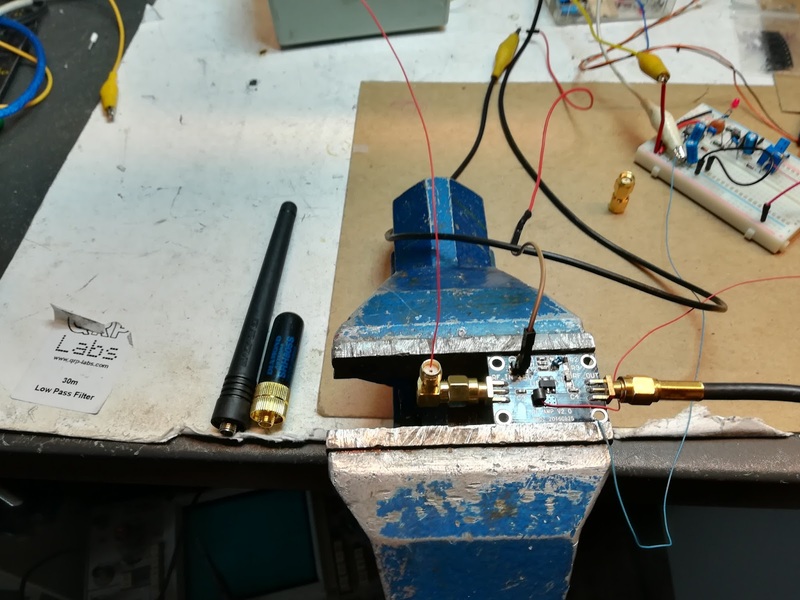 3W should be enough for a comfortable noise free FM signal. But only 27km away at PA0A the signal is weak too weak something must be wrong? I made a simple reference dipole of 2x17cm CU wire. With this dipole the signals where totally worse. So the Diamond does work? I got curious to look inside. Maybe moisture penetration degraded the antenna. EU send 1840kHz RX dial 1907 or 1909kHz where ever signals are seen. But in FT8 it is easy 100W!